Wow. I'm pretty impressed that you had the opportunity to hear Gary Taubes speak. Not sure how far you are through the book, but for me it was a moderately difficult read, but worthwhile. I lost track of all of the various studies, but he does effectively get his point across regarding his a) belief in proper nutrition and b) the misinformation provided by the USDA. BTW - I think people would have been JUST as impressed with a picture of GT as they would with the lemon curd bars. Kimi - Thanks for visiting! Great to meet you today. I LOVED those lemon curd bars. That recipe is a keeper. 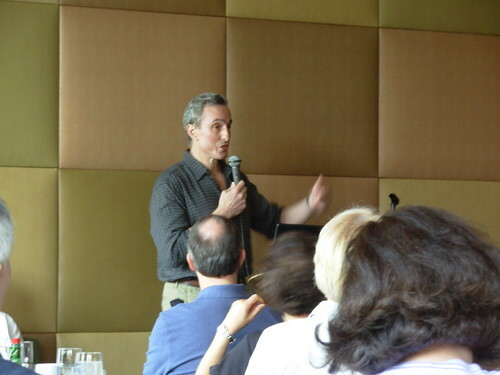 Oooh I'm jealous that you got a chance to see Gary Taubes! I'm in the process of reading GCBC for the first time and it's so informative - just so much to take in. Elizabth, keep at the book. I found after the first 5 chapters, it sped up in terms of ease of reading. After chapter 5, I thought it was much more pertinent to today's choices. Don't know if you subscribe to any podcasts, but Jimmy Moore of Livin la Vida Low Carb (http://livinlavidalowcarb.com/blog/) had Gary Taubes on back in January. I believe he answered your question stating that it is going to take a while for people to realize the USDA food pyramid is not the best nutrition model and that only through shouting from the rooftops will people ultimately get the message.